Examples, solutions, videos, and lessons to help High School students learn to use the structure of an expression to identify ways to rewrite it. For example, see x4 − y4 as (x2)2 − (y2)2, thus recognizing it as a difference of squares that can be factored as (x2 − y2)(x2 + y2). The following diagram shows the formula and some examples for factoring difference of perfect squares. 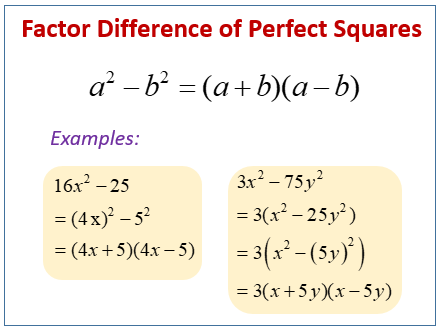 Scroll down the page for more examples and solutions of factoring difference of perfect squares. Factoring an expression with two perfect squares (like x-squared minus 4). Factoring the Difference of Two Squares - Ex 1. Factoring the Difference of Two Squares - Ex 2. Factoring the Difference of Two Squares - Ex 3. This video explains how to factor a difference of squares.